Held annually, the Scottish Rural and Islands Housing Conference covers a range of topical issues concerning rural housing in Scotland. This year’s conference, hosted by The Scottish Borders Housing Network, Berwickshire Housing Association, Eildon Group, Scottish Borders Housing Association & Waverley Housing, will take place on 27 and 28 October at Peebles Hydro Hotel. ​The pre-conference RIHAF meeting and Study Tour will take place on Wednesday 26 October. The conference aims to update and inform delegates of the changes and initiatives that are taking place, and to provide an opportunity for frank and open debate. This year's theme is Building Rural Communities and delegates will hear sessions on the new development environment and a 'Scandinavian Scotland'. The conference will close with a lively panel debate on the key challenges affecting rural development. As always, workshops will provide a more practical and in-depth look at issues including Rural Housing Initiative, Minimum Income Standard and Procurement. The conference will be of interest to anyone with an interest in rural housing issues, including staff and committee members from housing providers. This year’s venue is Peebles Hydro, set amongst 30 acres of grounds in the border town of Peebles. This charming, historic hotel features an indoor swimming pool, a spa, a gym and restaurant and has undergone major refurbishment. RIHAF would like to thank the conference sponsors, Edison Energy, Sunamp and Travis Perkins, for their support which helps keep delegate costs low, making this conference one of the best value events in the sector and we are delighted that once again we are able to offer a price freeze on residential places at the conference for RIHAF members. Bookings are now being taken for the conference and residential bookings are from £390.00 for RIHAF members. 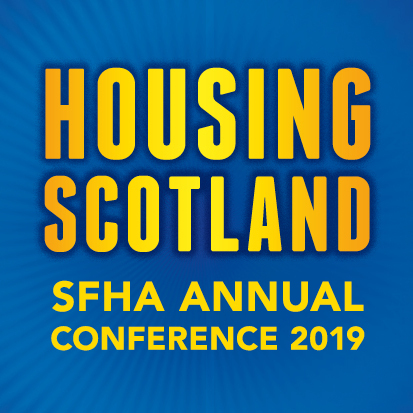 To book your place and for further details visit our website at www.sfha.co.uk or contact the events team on 0141 332 8113 or at events@sfha.co.uk.